Events we love – We’ll be there, will you? 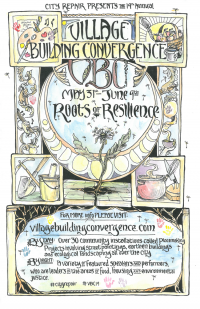 The Village Building Convergence (VBC) is City Repair’s flagship event featuring over 30 community-built projects happening all over Portland. Additionally, the VBC hosts a series of evening events featuring speakers and local musicians. 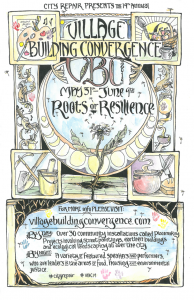 The theme is Community for the Health of it, and will feature tracks for those new to cohousing, in a forming community, living in cohousing and for mature communities. The ICSA thirteenth international conference will explore strategies that intentional communities use to promote the inclusion and empowerment of persons of diverse abilities, cultures, races, economic backgrounds, religions, ages, genders, and sexualities. It will explore intentional communities and community movements that focus on the experiences of groups that have historically been marginalized—as, for example, the Camphill movement does for persons with intellectual disabilities. Something is emerging. What has been learned from Communities in the past and what will the Communities of the Future look like? Join us for an intergenerational inquiry at the 5th annual West Coast Communities Conference. A blend of workshops and interactive social activities, we will go deep into the topics that matter most to our communities while also making time for joyous connections, ceremony, music, and celebration.